The U.S. bank prime rate is still at 3.25 percent. Some stability returned to the financial markets in the second half of October, with the stock market recovering most of its losses from earlier in the month. Similarly, changes in credit card offers settled down a little, with changes in just one category in the latest survey, after changes in three categories in the first half of the month. The biggest news concerning interest rates was the Federal Reserve announcement that it was ending its quantitative easing program. This program, which entailed the regular purchases of massive amounts of Treasury and mortgage-backed bonds, was designed largely to bring mortgage rates down, which it did -- to record levels, at one point. Observers are now concerned about the economic impact of rising rates as this program comes to an end. Credit card rates never fell as steeply as mortgage and deposit rates in response to Fed policy. Credit card companies thus retained a fairly healthy cushion for themselves against rising rates, so credit card offers may not be as sensitive as other rates to subsequent increases. While the Fed is discontinuing its bond purchases, for the time being it is continuing to hold (and reinvest) its existing portfolio of bonds. It is also planning on keeping short-term rates near zero for what the latest Fed statement described as "a considerable time." Both of these policy decisions should somewhat dampen the rate impact of the end of the quantitative easing program. While Fed policy should not immediately affect credit card rates, between an improving employment market, a weakening global economic environment, erratic inflation behavior, and skittish investors, there are still plenty of things that could disrupt rates in the months ahead. Consumer credit card offers tracked by this survey remained unchanged in the latter half of October. Despite this lack of movement in rates, consumers should be advised that there are great differences in rates within the category, and so there are money-saving values to be found by those who take the time to comparison shop. Student credit card rates remained unchanged in late October. When parents get credit cards for their children, they should stress that these cards are more than a convenience -- they are an opportunity to build a responsible credit history. Though student credit cards typically charge higher rates than other credit cards, the sooner a student can establish a history of conscientious bill-paying, the sooner that student may qualify for cards with lower rates. The average rate for business rewards credit cards remained unchanged, while the average for non-rewards cards rose by 40 basis points. This rise was due entirely to two new additions to the survey, to replace cards that had previously been discontinued. While the change was due to additions to the survey rather than changes in individual card offers, it should be noted that the type of credit card offers available often says something about the state of the market. In this case though, the change restored business non-rewards cards to an average rate close to where they have been most of the year. With no changes to consumer credit card offers, the spread between average rates and rates for customers with excellent credit remained at 4 percent. 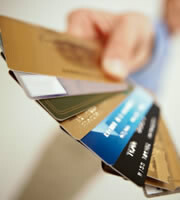 In total, IndexCreditCards.com surveys information from nearly 50 different credit cards, and includes multiple credit-rating tiers from many of those cards. Examples of offers surveyed include American Express, Capital One, Chase, Citi, Discover and other MasterCard and Visa branded cards. The information compiled not only demonstrates trends in credit card rates over time, but also indicates the different values credit card companies put on different target markets (consumer, business, etc. ), as evidenced by the differences between rates for those markets. 0 Responses to "Credit card rates settle down -- for now"